On Sunday the 29th of May 2016, Southend Hospital Radio completed a live on-air link to nearby hospital radio station Basildon Hospital Radio. As part of the Sunday Prescription show, presenter Lainey M linked up with Basildon Hospital Radio’s Alan Newman, who was presenting the Sunday request show. Basildon Hospital Radio links up with local community radio station Gateway FM once a month, so by linking to Southend Hospital Radio, the linkup was heard on FM, AM, on patient bedside units at both hospitals as well as via the Internet. The two presenters chatted about what each station was broadcasting at the time and sent greetings to patients to both hospitals. 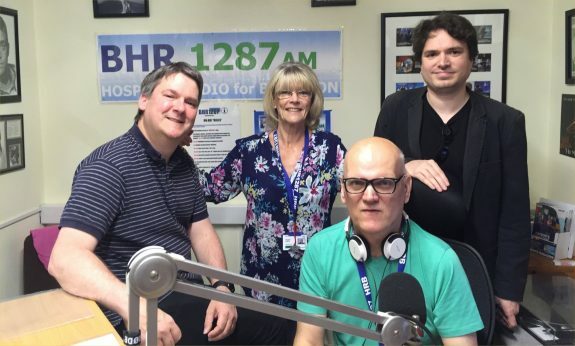 Southend Hospital Radio’s Chairman Pete Sipple had been invited to speak on Basildon Hospital Radio, and after discussions with his counterpart in Basildon, Jacqui James, the idea of the linkup was discussed, and it was great to have the opportunity to link the two stations together. I’ve just gone to the Basildon Hospital Radio site, and it seems to be working. You need to go to http://www.bhr1287.net/, click on “Listen Live”, and then select the pop-up player. If this doesn’t appear, you may be blocking pop-ups. If you’re still having a problem, you can listen to them via TuneIn at https://tunein.com/ – You can also listen to us on TuneIn, if you fancy giving us a try.